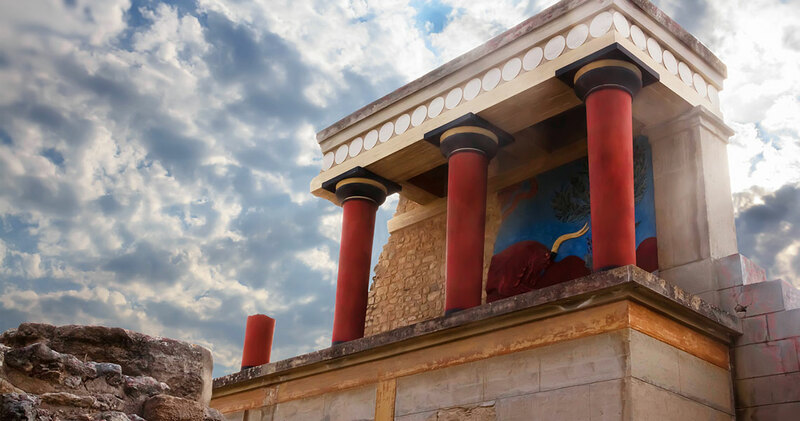 Visit along with TravelCrete.Tours Palace of Knossos and the Archaeological Museum of Heraklion. The Heraklion Archaeological Museum is one of the largest and most important museums in Greece, and among the most important museums in Europe. It houses representative artefacts from all the periods of Cretan prehistory and history, covering a chronological span of over 5,500 years from the Neolithic period to Roman times. The singularly important Minoan collection contains unique examples of Minoan art, many of them true masterpieces. The Heraklion Museum is rightly considered as the museum of Minoan culture par excellence worldwide. The museum, located in the town center, was built between 1937 and 1940 by architect Patroklos Karantinos on a site previously occupied by the Roman Catholic monastery of Saint-Francis which was destroyed by earthquake in 1856. The museum’s antiseismic building is an important example of modernist architecture and was awarded a Bauhaus commendation. The colours and construction materials, such as the veined polychrome marbles, recall certain Minoan wall-paintings which imitate marble revetment. The two-storeyed building has 27 galleries, a gallery for audio-visual displays, extensive modern laboratories, a cloakroom, a cafeteria and a museum shop that sells museum copies, books, postcards and slides.